When using the SharePoint Online Office 365 or OneDrive for Business feature "Open With Explorer" or "View in File Explorer" you may receive the error "\\domain.sharepoint.com@SSL\DavWWWRoot\Shared Documents\ is not accessible. You might not have permission to use this network resource. Contact the administrator of this server to find out if you have access permissions. Access Denied. Before opening files in this location, you must first add the web site to your trusted sites list, browse to the web site, and select the option to login automatically". This is the error dialog that is shown when using "Open With Explorer". "Open With Explorer" is a feature that is accessed from within the Internet Explorer web browser from the ribbon menu. Where to access "Open With Explorer". 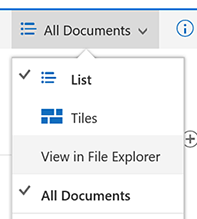 An alternativate way to access the feature is using the "View in File Explorer" option from the new SharePoint web browser interface. Where to access "View in File Explorer". Choosing either one of these options will cause Windows File Explorer to open after a short delay at which point the error dialog shown above may show. How To Resolve "Davwwwroot Is Not Accessible"
To resolve the error "DavWWWRoot is not accessible" you need to check on two things. Firstly ensure that your SharePoint Online tenant is added to Internet Explorer's trusted sites. To do this open up the Internet Options dialog in Internet Explorer, click the Security tab, select Trusted sites then click Sites. Add the two URLs https://domain.sharepoint.com/ and https://domain-my.sharepoint.com/ to the trusted sites where domain should be replaced with your Office 365 tenant name. 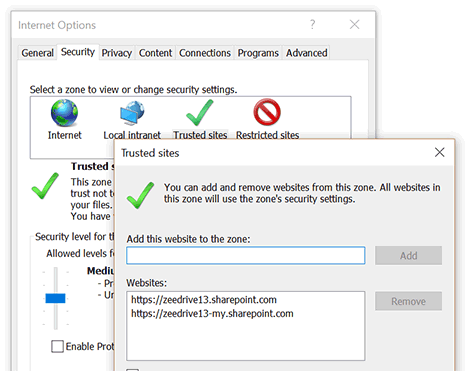 Add in your Office 365 SharePoint Online URLs to your trusted sites. 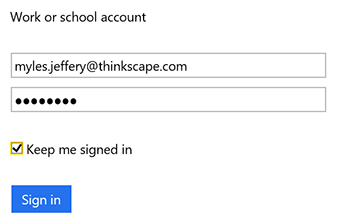 Secondly, when signing in to Internet Explorer check the box "Keep me signed in" before clicking the Sign in button. Check the "Keep me signed in" check box. You should now find when using the "Open with Explorer" feature that the contents of your document library shows in Windows File Explorer. You may need to sign in to Internet Explorer regulary to keep the authentication token refreshed and to prevent the error occuring again. If you were using "Open with Explorer" as a means of migrating your files from your local drive or network drive to Office 365 then consider using an alternative tool for your migration such as a dedicated file migration tool like Files To Go. Files To Go is not impacted by the "Davwwwroot Is Not Accessible" error as Files To Go authentications directly with Office 365, circumventing Internet Explorer altogether. A free trial of Files To Go is available for you to try today. An alternative to "Open with Explorer" is to use a dedicate network drive mapping tool like Zee Drive. Zee Drive makes the process of mapping network drives to OneDrive for Business and document libraries easy and reliable. Zee Drive authenticates directly with Office 365 and is not affected by the "Davwwwroot Is Not Accessible" error as it does not rely on Internet Explorer. To find out more about Zee Drive or sign up for a free trial click here. This article was last updated on 23rd July 2016. Zee Drive is a reliable and supported alternative to "Open With Explorer". Zee Drive will map your OneDrive for Business and SharePoint Online Office 365 document libraries to network drives. This means you can work with your files through the familiar interface of Windows File Explorer. Zee Drive will keep you signed in to Office 365 without needing any kind of Internet Explorer configuration this is because Zee Drive authenticates directly with Office 365. It does not rely on Internet Explorer for authentication. Find out more about Zee Drive. Zee Drive can map network drives to OneDrive for Business and team site libraries. If you are migrating your files from a local drive or network drive to Office 365 with "Open With Explorer" and encountering this issue, then why not consider our file migration tool, Files To Go, to help you migrate instead? Files To Go does not rely on Internet Explorer for authentication and will help streamline your migration to Office 365 from only $195.00 USD. Find out more about Files To Go.